Transplanted from the hipster-foodie capital of the west (Portland, of course), Larchmont's craft creamery Salt & Straw puts an artisanal churn on the standard scoop. Their extensive menu boasts flavors both sinful and curious including Almond Brittle with Salted Ganache, Freckled Woodblock Chocolate, Avocado Strawberry Sherbert and Santa Ynez Valley Walnut Oil—many of which feature ingredients exclusive to Southern California, reflecting the company's "farm-to-cone" philosophy. The best part? You don't have to choose just one. For $10, guests can opt for an ice cream flight including your choice of four flavors from both classic and seasonal menus. The pristine globules are served in healthy scoops across four individual glass bowls, presented on a (undoubtedly reclaimed) wood tray. Can't decide which to pick? 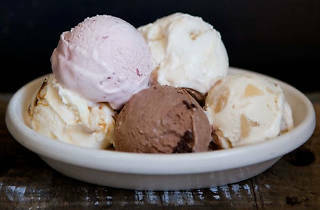 Salt & Straw's staffers, who are about as chipper as you'd expect artisanal ice cream scoopers to be, are thrilled to help you assemble the perfectly complementary quartet. You know this place is good if it’s got a long line wrapping around the block until 11 pm closing every night. I thought people would be hitting the bars but no, just as many people are trying to get some ice cream at 11 pm. You are able to sample any flavor you want once you are at the front of the line. The flavor pairings are really good – my all-time favorite is the coffee with Compartes love nuts. Most flavors taste like they have some kind of brittle in them, so the texture and flavors are just perfect. Probably my favorite ice cream place in LA. Although the lines can be long, the staff is always friendly and very quick to offer plentiful taste tests. They frequently have excellent seasonal flavors (like "Essence of Ghost" in October). Also, their cookie dough flavor is one of the best Ive ever had - so much cookie dough! Worth the long line (but it moves super fast)! Best tasting ice cream in LA in my opinion. So delicious, friendly staff, and unique flavors (plus variations of originals). I love Salt & Straw. Maybe because they have an ever changing monthly menu that makes it exciting to go in every time, or maybe it's because they let you sample EVERY SINGLE FLAVOR, or maybe it's because their ice cream is top quality and delicious.... whatever the reason, I love coming here every chance I can! Extremely high quality ice cream with unique, fun flavors to boast. An enthusiastic and friendly team of ice cream scoopers too! I have never had so much fun sampling ice cream until I started coming to Salt&Straw. 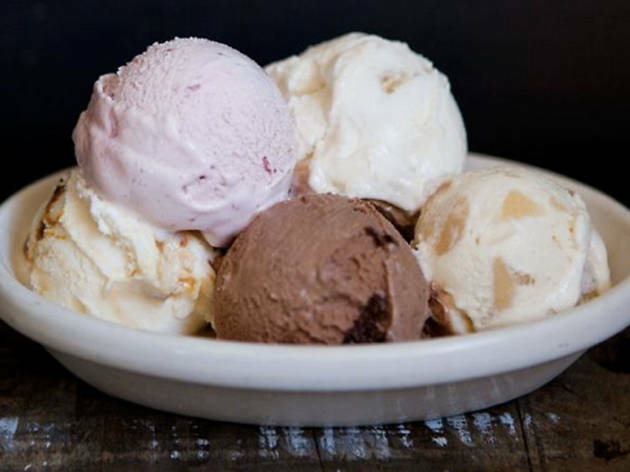 Salt & Straw is amazing—from their always-creative flavors to chef collaborations to community fundraisers, they are everything that's good about ice cream. I had the luck of trying Salt and Straw for the first time in Portland and the local flavors (what they call "farm to cone") blew me away. The ice cream definitely has a high butter content but they have a light hand with the local flavors where nothing is too sweet or very strongly pronounced. The LA branch in Larchmont Village takes advantage of local flavors and artisanal products as well. They have a board of their classic flavors, which always contains at least one vegan option. The seasonal flavors are really what keeps me coming back. They stay for a limited time, but are indeed very memorable. I tend to really enjoy savory sweet, but these flavors blow away what one would tend to find doable with ice cream flavors. The bone marrow flavor does not taste meaty, but you can slightly detect the funk, which gets chased by the sweet cherry flavor. The butternut squash evokes memories of perfectly caramelized and sweet squash with a backdrop of the more funky and tangy goat cheese. A crunchy pepita seed brittle adds more sweetness and texture. These flavors need to be tasted to be understood. I love choices that you cannot put together in your head, but they work on your palate. So I just went to Salt and Straw on Ventura and it was amazing. I loved it. I'm kinda biased because my parents moved to Oregon a few years ago so I'm all about any Portland food transplants but honestly, it's so amazing. I had the salted caramel shenanigans and it was creamy, salty, sweet, fluffy aka all the things you want ice cream to be. Although it's not cheap (about $5 for a scoop...) it's definitely a delicacy that should be enjoyed from time to time. You should definitely grab a scoop, especially while it's still hot! I first visited Salt & Straw in Portland and was so excited to see it in LA! They have a ton of out-of-the-box flavors, which makes it exciting to choose from. This place is definitely worth visiting if you're in Larchmont Village. The "salt" part of this place is the only reason why I am giving this place 3 stars. While some of the flavors are ok, the salt part of their ice creams seems to overwhelm. I also happen to simply like basic, old fashioned ice cream, so perhaps if you're more adventurous with your ice cream you will like this place. My favorite part about Salt & Straw is how they incorporate LA products into their ice cream: Compartes chocolate, Stumptown coffee, even employing Roy Choi at one point to come up with his own flavor. It may hail from Portland, but the LA branch definitely embraces this city. Lines can be a bit long and scoops are pricey - it's artisanal ice cream after all - but it's definitely worth a stop if you're in Larchmont Village.